We’d love your help. Let us know what’s wrong with this preview of Seeing Is Forgetting the Name of the Thing One Sees by Lawrence Weschler. Traces the life and career of the California artist, who currently works with pure light and the subtle modulation of empty space. To ask other readers questions about Seeing Is Forgetting the Name of the Thing One Sees, please sign up. Firstly, I read this book at the recommendation of my Senior Seminar professor, who, instead of telling me to read the lengthened version, encouraged me to get the first edition with 100 less pages because it was cheaper. Instead, I figured if I was going to read it, I might as well read it all, and found the extended edition in the Harold Washington library which I have promptly renewed seven or eight times. I would highly suggest reading the extended version, as I didn't start gleaning pieces Firstly, I read this book at the recommendation of my Senior Seminar professor, who, instead of telling me to read the lengthened version, encouraged me to get the first edition with 100 less pages because it was cheaper. Instead, I figured if I was going to read it, I might as well read it all, and found the extended edition in the Harold Washington library which I have promptly renewed seven or eight times. I would highly suggest reading the extended version, as I didn't start gleaning pieces of information that were useful until after the lengthy introduction (yes, two hundred pages) to Robert Irwin. After three hundred pages, I still don't know how I feel about the minimal artist, whose personality is not one that seems recognizable. He seems foreign, but I must admit, also a genius. Seriously, I think this guy has it all figured out and he's just laughing at the rest of us, or trying to help us figure out the secret to life, since he's so far ahead of us in that region. Maybe this is why it took so long for me to start collecting useful information from the book for my own practice, because Irwin is such a strange, unearthly character. Weschler perhaps describes Irwin perfectly when he states that his "egolessness...can at times seem positively egomaniacal." And this is precisely why Irwin is so hard to connect with. He is at once completely humble while also remaining completely stuck-up. And maybe this is also why people have such a hard time approaching his work as well. Because no one can tell if he is sitting behind the curtain laughing at our stupidity, our need to find meaning, or honestly asking us to experience. I would have to say, this book is definitely not for everyone. Though I think it would be a nice introduction to contemporary art, I would also caution that it is a nice re-introduction for those of us who are well versed in conceptual art aesthetics and theory. For me, this book came at the most perfect time. I was just finishing up my final undergraduate courses and emerging into the world. I'll be the first to tell you, I am completely disillusioned, especially when it comes to "art." I am completely stuck-up and have a hard time trusting in the mantra "anyone can make art." This book is perfect for the disillusioned. In many ways, Irwin reminded me why I make art, why anyone makes art. I didn't enjoy every page of this book. Sometimes it's really hard to continue reading it. But I'd urge any young artist to power through it. You will be frustrated, mostly by the fact the Irwin is a living paradigm, constantly shifting and seemingly contradicting himself every turn. But somehow it all makes sense. Seriously, this guy's figured it out, all of it. "Irwin's sensibility is immensely playful, but the play is absolutely serious." I'll probably come to a point in my career when I'll need this book again, but I certainly hope I won't have to trudge through the heaviness of it for at least ten years. With that said, I should also say, read it. An amazing portrait of Robert Irwin, a modern artist who I wasn't aware of until I began this book. The title of this book captivated me when I came across it via a random link somewhere on the net. I found as I dug in that many of the themes Irwin deals with are the same I love to ponder: the abstract vs the concrete. The role of perception and thought in how one experiences the world. Spirituality and mysticism, and of course zen and buddhism. 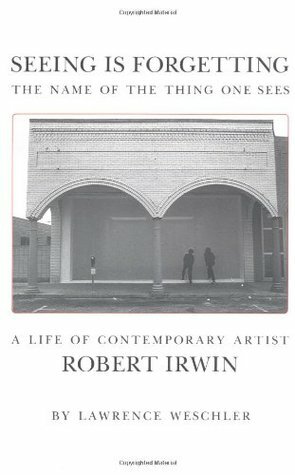 A fascinating book, and I _really_ want to find so An amazing portrait of Robert Irwin, a modern artist who I wasn't aware of until I began this book. Probably the best book about an artist you'll ever read (assuming you ever do read one). Weschler does what any/every greater writer should do. That is, to coax the reader to invest (and perhaps even "care" about) a subject heretofore (yes, I just used heretofore in a sentence --- correctly?) thought/felt to be uninteresting. *With god (intentional lower case) on my side (thanks Zimmerman) I'll be able to take a graduate course with Mr. Wes Probably the best book about an artist you'll ever read (assuming you ever do read one). I read this book on after reading an article about it online (I can't remember if it was NY Times or LA Times). Anyway, I've never really understood Irwin's type of art, that is until I read this book. I really wish that I could see some of the paintings that are described, the early ones that he wouldn't allow to be photographed. "curiously came to supersede ambition as his primary motivation"
the ENTIRE art and technology section but specifically: "our interest is in a form where you realize that the media are just perception. the experience is the 'thing', experiencing is the 'object'"
"boredom is a very good tool"
"art existed not in objects, but in a way of seeing"
on compounding perception => abstrsction: "each new whole is less than a fun of it's parts"
"even if there is a God: fine, so what? That wouldn't replace your responsibility to act on your own unique potential"
A friend had recommended this to me for the early descriptions of Los Angeles in the 40's and 50's, but I read on, fascinated by Robert Irwin's dedication to an art that teaches us how we experience our world. The title comes from a poem by Paul Valery. This book blew my mind a few times, and in between was super interesting. Recommended for anyone who makes art or is interested in understanding the past 75 years or so of visual art. Had anyone told me 2 to 30 years ago that I would 1) read a biography about a contemporary artist and 2) gave it 5 stars, I would've been HIGHLY skeptical. After having seen and heard this book mentioned and recommended multiple times in numerous types of media, I bit the bullet, found a used copy, and was astonished to find myself engrossed every time I picked it up. Weschler's writing style is straightforward, conversational, and a pleasure to read. And this was incredibly important, because i Had anyone told me 2 to 30 years ago that I would 1) read a biography about a contemporary artist and 2) gave it 5 stars, I would've been HIGHLY skeptical. After having seen and heard this book mentioned and recommended multiple times in numerous types of media, I bit the bullet, found a used copy, and was astonished to find myself engrossed every time I picked it up. Weschler's writing style is straightforward, conversational, and a pleasure to read. And this was incredibly important, because it effectively transferred the message transmitted by Irwin in his ridiculously well-spoken and uniquely capable method of describing his creative process in ways that are both engaging and completely unpretentious. At the risk of unmasking my inadequacy to the task of trying to boil this message down, my translation is that Irwin wanted people to see the world around them in a way that that forced them to be present in that place and time along with an accountability to what they were seeing (or not seeing). His art exists in your perception of it, which means that the definition varies from person to person, but for those who “get it”, the impact is profound. “Minimalist” seems like an apt description, in that sometimes a work might just be the way light hit a canvas or a room with certain items situated specific to the time of day. Interestingly, I think that had I gone to one of his exhibits when I was younger, there’s no chance that I would’ve appreciated it, which would’ve been in line with my likely apprehension to reading about it. This was a difficult book to read becausse of my separate reaction to Robert Irwin as a person and a thinker. Before reading 20 pages, I had the opinion that Irwin is a self-involved prat. But, his ideas about art and experience dovetail nicely with my recent meditations. Due to my recent introduction to traditional African art (where the question whether what is displayed in museums is art divorced as it is from its performance context--especially in regards to the masks), I've been examining w This was a difficult book to read becausse of my separate reaction to Robert Irwin as a person and a thinker. Before reading 20 pages, I had the opinion that Irwin is a self-involved prat. But, his ideas about art and experience dovetail nicely with my recent meditations. Due to my recent introduction to traditional African art (where the question whether what is displayed in museums is art divorced as it is from its performance context--especially in regards to the masks), I've been examining what "art" is. What Irwin posits in this book resonates with me and provides satisfaction. But, then he'll state something that irritates me as I perceive a lot of male ego and quite a bit of white male privilege. Weschler does a good job of presenting Irwin with warts and all. You won't get an in-depth history of the man, but you'll be allowed to see how his process has unfolded over decades--as well as his awareness of that process. This is a must-read for students of art and art history. This is a good read for students of philosophy, and this is a fascinating read for people who build hot rods, drink Coke, or vacation in Ibiza during the winter. I'm reading this A: Because I looooooved Mr. Wilson's Cabinet of Wonders and B: Because I most often find myself writing about art and artists, and always want the writing to stand on its own, as just that: writing. The reviews of this book give it real merit as a great story brilliantly told, period. So I'm excited to really get into it. I just got my hands on it, and then some new shelves arrived, so the book is currently lost in my "to reshelve" piles. Drat. OK, I tried. I really did. But this I'm reading this A: Because I looooooved Mr. Wilson's Cabinet of Wonders and B: Because I most often find myself writing about art and artists, and always want the writing to stand on its own, as just that: writing. The reviews of this book give it real merit as a great story brilliantly told, period. So I'm excited to really get into it. I just got my hands on it, and then some new shelves arrived, so the book is currently lost in my "to reshelve" piles. Drat. Tony Perez (Editor, Tin House Books): As if she hasn’t given me enough already, last time I saw Darcey Steinke, she gave me a copy of Lawrence Weschler’s book on Robert Irwin: Seeing is Forgetting the Name of the Thing One Sees. I knew Irwin’s work, but was by no means an aficionado; I don’t know how Darcey knew it would, but this book absolutely captivated me. Weschler is succinct but almost chatty as he takes us through Irwin’s early life and the post-war west coast art-scene, and as he walks Tony Perez (Editor, Tin House Books): As if she hasn’t given me enough already, last time I saw Darcey Steinke, she gave me a copy of Lawrence Weschler’s book on Robert Irwin: Seeing is Forgetting the Name of the Thing One Sees. I knew Irwin’s work, but was by no means an aficionado; I don’t know how Darcey knew it would, but this book absolutely captivated me. Weschler is succinct but almost chatty as he takes us through Irwin’s early life and the post-war west coast art-scene, and as he walks us through each step of Irwin’s move from abstract expressionism to his minimal instillations experimenting with light and perspective. Irwin patiently and painstakingly pushed his project forward, leaving each success behind him just as the public, and even the art world, was catching up. I haven’t stopped thinking about the book—Irwin’s process and his worldview (I also learned that Carlsberg Elephant Beer tastes best when drunk within the aural context of a 650 Hz tone). Was a life-changing event when I picked this book up. Irwin is a reason I still paint and observe. You will be affected by this book in one way or another, but in my way I found joy in not just the making and painting, but thinking about what I was making and painting. If you've never seen an Irwin in person, especially one of the light and shadow works go to Fort Worth Museum of Modern Art I know there is one there right now. I read this before I had seen a piece and it made it that much more o Was a life-changing event when I picked this book up. Irwin is a reason I still paint and observe. You will be affected by this book in one way or another, but in my way I found joy in not just the making and painting, but thinking about what I was making and painting. If you've never seen an Irwin in person, especially one of the light and shadow works go to Fort Worth Museum of Modern Art I know there is one there right now. I read this before I had seen a piece and it made it that much more of an intriguing encounter when I saw that one. This is a great book. Irwin's line of inquiry from swing-dancing and working on cars as a kid through painting to installation and public 'sculpture' in his later life evidences a curious mind more interested in questions than answers. Get the more recent publication with more recent conversations. I'd like to read the companion to this book, which is a collection of conversations Weschler had with David Hockney that parallel and dispute some of the ideas presented by Irwin on the trajectory of t This is a great book. Irwin's line of inquiry from swing-dancing and working on cars as a kid through painting to installation and public 'sculpture' in his later life evidences a curious mind more interested in questions than answers. Somehow, a biography of an artist that has never interested me who works in a style that has never pulled at the heartstrings of mine eye was the catalyst for some of the best creative energy that ever ran through these veins. Page after page poured out, winterlit on the back porch during the slow closing shift, shirking duty as a bundle of sweaters and earflapped hat. Coincidentally, it also took me back to Baudelaire. An excellent look into the life and mind of minimalist artist Robert Irwin. The connections he makes between early Southern California car culture and how it informs his work is fascinating in itself. For artists, there is a discussion about how to create the illusion of a perfect square and the resulting ratio he arrived at. Inspiring in its illustration of Irwin's dedication to and pursuit of excellence in his work. Picked this up at the Marfa Bookstore (worth a visit if in the area). As it says in the title, a new expanded 'artist biography' on Irwin, bringing his story up to date since 1985, including what looks to be juicy reading on his experience designing the Getty Center 'Acropolis' Gardens and his clashes with Meier's intentions. The original book is as important as a volume of Rilke, and Irwin's meditations and insights into his artistic process are the equal of Richard Serra's. A classic, life-changing book. Weschler makes a hero out of Irwin. An artist who rarely let his work be photographed needed a book like this to be written to describe his life and work. The result is a fantasy world of art and California life. The most satisfying thing is that when you actually see Irwin's work in person, you learn that it's true. His work leaves you invigorated, mystified, and changed. Lawrence Weschler, a graduate of Cowell College of the University of California at Santa Cruz (1974), was for over twenty years (1981-2002) a staff writer at The New Yorker, where his work shuttled between political tragedies and cultural comedies. He is a two-time winner of the George Polk Award (for Cultural Reporting in 1988 and Magazine Reporting in 1992) and was also a recipient of Lannan Lit Lawrence Weschler, a graduate of Cowell College of the University of California at Santa Cruz (1974), was for over twenty years (1981-2002) a staff writer at The New Yorker, where his work shuttled between political tragedies and cultural comedies. He is a two-time winner of the George Polk Award (for Cultural Reporting in 1988 and Magazine Reporting in 1992) and was also a recipient of Lannan Literary Award (1998). His “Passions and Wonders” series currently comprises Seeing is Forgetting the Name of the Thing One Sees: A Life of Contemporary Artist Robert Irwin (1982); David Hockney’s Cameraworks (1984); Mr. Wilson’s Cabinet of Wonder (1995); A Wanderer in the Perfect City: Selected Passion Pieces (1998) Boggs: A Comedy of Values (1999); Robert Irwin: Getty Garden (2002); Vermeer in Bosnia (2004); and Everything that Rises: A Book of Convergences (February 2006). Mr. Wilson was shortlisted for both the Pulitzer Prize and the National Book Critics Circle Award; and Everything that Rises received the 2007 National Book Critics Circle Award for Criticism. Recent books include a considerably expanded edition of Seeing is Forgetting the Name of the Thing One Sees, comprising thirty years of conversations with Robert Irwin; a companion volume, True to Life: Twenty Five Years of Conversation with David Hockney; Liza Lou (a monograph out of Rizzoli); Tara Donovan, the catalog for the artist’s recent exhibition at Boston’s Institute for Contemporary Art, and Deborah Butterfield, the catalog for a survey of the artist’s work at the LA Louver Gallery. His latest addition to “Passions and Wonders,” the collection Uncanny Valley: Adventures in the Narrative, came out from Counterpoint in October 2011. Weschler has taught, variously, at Princeton, Columbia, UCSC, Bard, Vassar, Sarah Lawrence, and NYU, where he is now distinguished writer in residence at the Carter Journalism Institute. He recently graduated to director emeritus of the New York Institute for the Humanities at NYU, where he has been a fellow since 1991 and was director from 2001-2013, and from which base he had tried to start his own semiannual journal of writing and visual culture, Omnivore. He is also the artistic director emeritus, still actively engaged, with the Chicago Humanities Festival, and curator for New York Live Ideas, an annual body-based humanities collaboration with Bill T. Jones and his NY Live Arts. He is a contributing editor to McSweeney’s, the Threepeeny Review, and The Virginia Quarterly Review; curator at large of the DVD quarterly Wholphin; (recently retired) chair of the Sundance (formerly Soros) Documentary Film Fund; and director of the Ernst Toch Society, dedicated to the promulgation of the music of his grandfather, the noted Weimar emigre composer. He recently launched “Pillow of Air,” a monthly “Amble through the worlds of the visual” column in The Believer.